Before summer is over, I wanted to share my favorite summer treat. One of my favorite restaurants to go to on date night is Winger’s. Not only for their amazing Sticky Finger Chicken Salad, but for their amazing Asphault Pie dessert. I love the combination of caramel, chocolate & mint. It seems kind of unusual, but goes together perfectly. Besides the great flavor, it is a great dessert for those last hot summer nights. For the Oreo crust, place the 24 Oreo cookies in a food processor and blend until fine crumbs (or, place in a ziploc bag and crush with a hammer or pan until fine crumbs). Add the melted butter to the crumbs and combine until the cookie crumbs are soft and moist. Spray a pie plate with cooking spray and pour the oreo and butter combination into the pie plate. With a fork or the back of a spoon, press down the crust evenly on the bottom of the pan and along all of the sides. Cover the crust with saran wrap and place in the fridge for one hour before you fill with ice cream. Twenty minutes before the hour is over for letting your crust set, remove the ice cream from the freezer to soften. 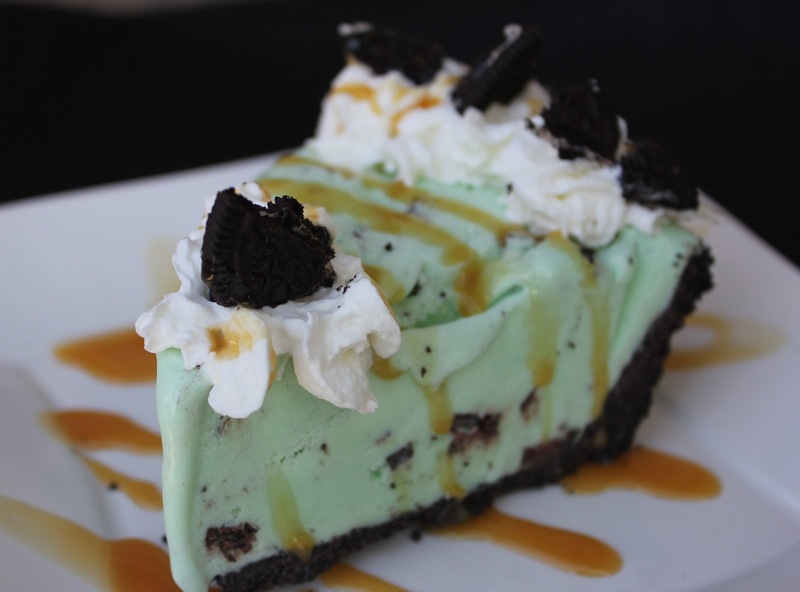 After 20 minutes, remove the Oreo crust and dump the ice cream into the crust. Spread the ice cream around evenly in the pie shell. Place the plastic wrap back on the pie and place in the freezer until ready to serve. Once you are ready to serve, slice the pie and plate each serving. Spray a generous portion of whipped cream on top of each piece and top with crushed Oreos and caramel topping.